Polytetrafluoroethylene (PTFE) is a synthetic fluoropolymer of tetrafluoroethylene. 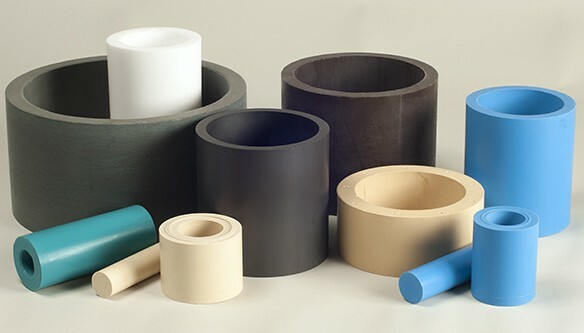 A high-molecular weight solid, PTFE has one of the lowest coefficients of static and dynamic friction of any sealing material. PTFE has one of the highest continuous operating temperatures of any polymer (apart from PEEK and Polyimide) – up to +260°C – and good dielectric properties independent of temperature. PTFE is, to a large extent, chemically inert. It is resistant to acids, alcohols, aldehydes, bases, esters, aliphatic, aromatic and halogenated hydrocarbons, ketones, mineral and vegetable oils, and oxidizing agents. Virgin PTFE is a ‘soft’ material that is suitable for static and dynamic sealing applications. However, where further reduction in friction, improvements in mechanical properties and wear / abrasion resistance are required, aromatic polyester, bronze, glass, carbon, carbon fibre, graphite, stainless steel, as well as other more exotic filler materials, can be compounded in. PTFE has no ‘memory’, which limits its use as a virgin material in higher-pressure applications. To take advantage of its specific characteristics for sealing applications, composite seals are designed. They usually comprise a PTFE pad or jacket and a suitable sized energiser to provide the sealing force. The energiser is normally either an elastomer or a metal spring. Using an energiser allows the sealing force and thus friction force and wear to be fully optimised for the application. Modified PTFE offers much improved high temperature stability and lower gas permeability than PTFE, at the expenses of low temperature capability (from -250°C up to -200°C), whilst retaining an almost universal chemical resistance. Repack-S modified PTFE compounds offer exceptional resistance to extrusion and stress relaxation in high temperature applications. Minimum continuous operating temperature: -250°C. Repack-S has used many different quite of PTFE compounds. Please contact our Sales Team to discuss your application(s) and obtain the relevant material datasheet(s).